The Worlds Biggest Automated Port Terminal Opens Up! 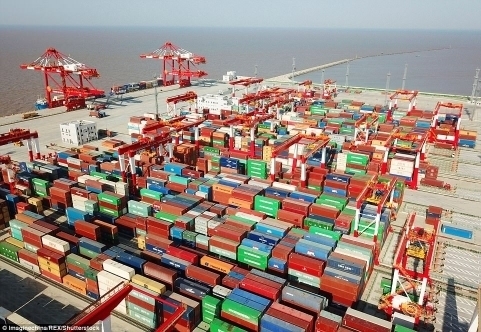 The Worlds biggest automated port terminal has opened up, China’s Shanghai port has been subject to a £1.37 Billion development to turn one of its terminals fully automated. Due to this development the whole £8.5 Billion port will be able to process more than 40 million containers a year – the most in the world. With the shipping of goods being one of the biggest industries in the world the technology that makes this industry run is forever changing with the aim of making it as cheap and efficient as possible. Rather than having man powered machines the port will have 26 bridge cranes, 130 auto-guided vehicles and 120 rail-mounted gantry cranes which can all be controlled from afar. The automated terminal itself will be able to handle over 6.3 million containers a year. The automated port means that labour costs will be slashed by 70 per cent and handling efficiency boosted by 50 per cent. Instead of an army of workers the machines will be controlled by workers in a control room monitoring operations. Giant ports like Shanghai helped China pass the U.S. as the world’s biggest trader in 2012, as the total value of its imports and exprts hit £2.45 Trillion, edging past the £2.44 Trillion trade registered by the U.S.